Dissolve yest in 1/4 cup of warm water. Scald the milk and add the sugar. When cool enough add the yeast and about 2 cups of flour. Mix thoroughly and let rise till double in bulk. Add melted margarine, slightly beaten egg, salt, nutmeg and rest of the flour. 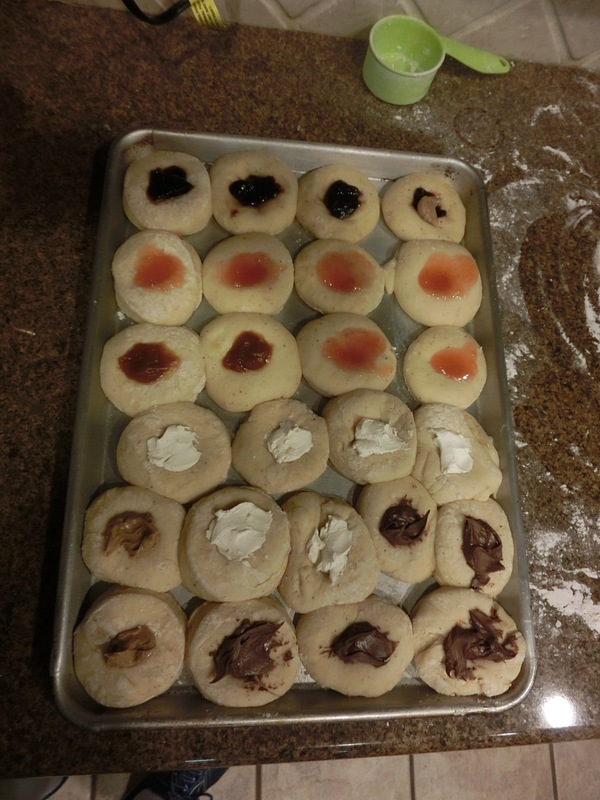 For topping: 1/4 cup flour, 1/4 cup of sugar, and enough margarine to make “crumps” for the topping. May add vanilla or cinnamon to mixture. Overall, this was a pretty good experience. My daughter needed some daddy time (or I needed some daughter time), so the “date” was scheduled. We read through the recipe, and did our best as we swam into unfamiliar territory. The first “rising” was all done in the bowl-we did no needing. The second rising went fine AFTER we heated the oven to 200, shut off the oven, and put the dough in. It struggled to double without the heat. When rolling out the dough and cutting it, the dough should be rolled out to about 1/2″. We had some that were thicker and some that were thinner. When the dough rises for the last time, it should probably be between 3/4 – 1″. We did not do the crumps. I don’t think we decided not to. I believe it was just an under sight. 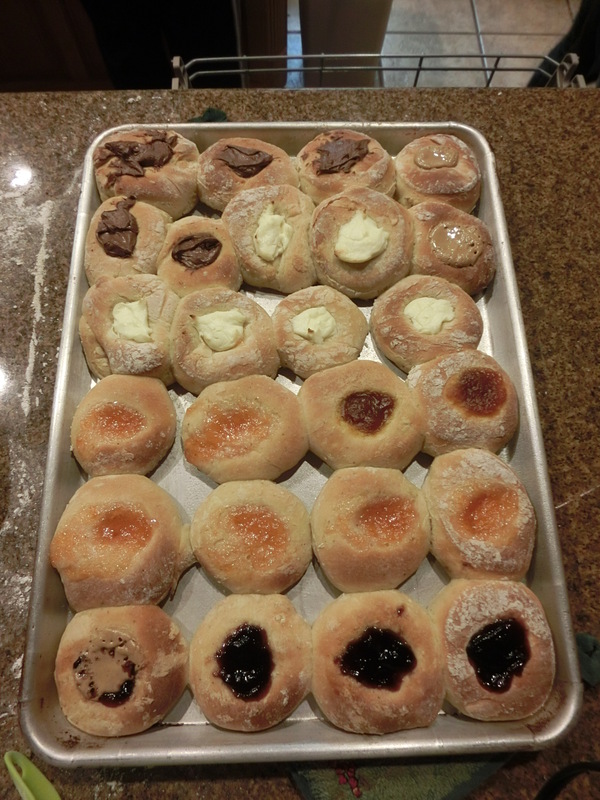 The kolaches were great right out of the oven. After they cooled up to 2 (maybe 3) days later, 10 seconds in the microwave worked very well. Lastly, what toppings to use? Jellies worked well. I especially liked the blackberry. We had some pumpkin butter. Also very good. Cream cheese also worked very well. Not often a cream cheese participant, but it was not bad. Nutella worked well. I think the girls preferred it over me. Peanut butter seemed to work okay. When the peanut butter cooled, it had less affinity for the kolache than the jellies. Peanut butter/Jelly: Interesting. Try it for yourself. Some things are read said not to use uncooked fruit. When the fruit cooks, the liquid given off by the fruit makes the kolache wet/doughy in the middle.